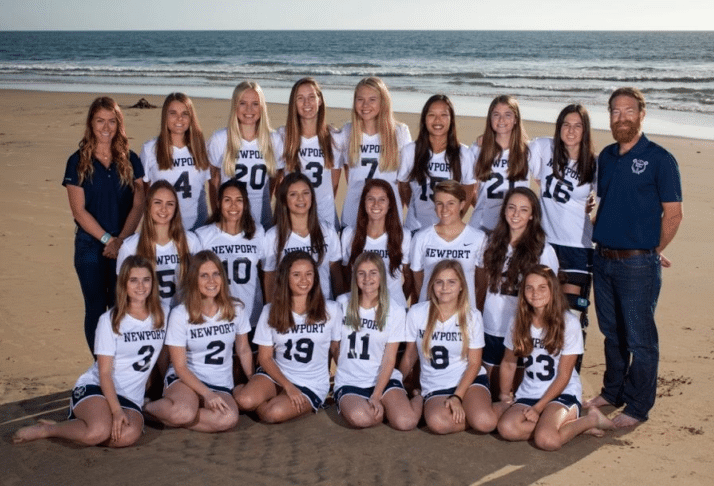 Newport Beach – The last time the Newport Harbor girls lacrosse team beat Corona Del Mar in the Battle of the Bay rivalry game was 2009 when the Sailors won 8-7. In a battle of two top 10 ten teams, the no. 7 Sailors upset the no. 4 Sea Queens 9-7 to halt their seven-game losing streak against their Back Bay rival. The Sailors and the Sea Queens met in this year’s Battle of the Bay with both teams coming off of big wins. The Sailors upset No.2 ranked St. Margaret’s 14-12 on Tuesday. The Sea Queens edged Beckman on the road 11-10 on Wednesday. “We came in with our game plan and nothing is ever perfect, but for the most part did what we wanted to do and it succeeded,” Newport Harbor coach Matt Armstrong said. The Sailors broke a 1-1 tie in the first half by scoring four straight to take a 5-1 lead. Corona Del Mar didn’t score again until the 4:28 mark and found themselves down 6-2 at halftime. “For the first half we didn’t show up and we didn’t play our game. We didn’t play as a team as much as we have in the past,” Sea Queens head coach Aly Simons said. After halftime, the Sea Queens began to rally. Two consecutive CdM goals cut Newport Harbor’s lead down to 6-4, forcing Armstrong to call time out. After the time out, the Sailors came back with two goals of their own to build their lead to 8-4. The Sea Queens didn’t go down without a fight, as they scored three consecutive goals to get within 8-7 with 3:52 remaining in the game. However, Sarah Farley added an insurance goal to give the Sailors some breathing room with a 9-7 lead. The Sailors held on for the rest of the game to clinch their first win over the Sea Queens since 2009. “At the moment when we could’ve been nervous when we could’ve fallen apart, we sucked it up, we brought it back together and really owned it,” Armstrong said. Katie Hendrix led the Sailors (7-3) with four goals, while Farley added three and Heather Roberts and Caroline Farley added one goal. Goalie Jade Rettig made nine saves for the Sailors. Armstrong said Hendrix and Sarah Farley’s motivation in the win was losing to Corona Del Mar the past three years and knowing that they can win it this year. “I feel the past couple games our defense has been strong. Our goalie [Rettig] really stepped up. She was just awesome and it all started with the defense,” Sarah Farley said. For the Sea Queens (4-3), Caroline Brewster led the way with two goals. Kennedy Mulvaney, Jensen Coop, Ellery Amdor, Emily Faludy, and Maria LaBruna scored one goal each. Mulvaney added four assists while goalie Ashley Olsen had five saves for Corona Del Mar. Simons said this wasn’t her team’s best game and she hopes her team can continue to grow and not let this loss hurt them as the season progresses. Newport Harbor’s next game is Tuesday at Great Oak (4-4) at 5:30 p.m. For Corona Del Mar, its next game is Monday at home against University (5-2) at 3:15 p.m.